The Roseland Community Festival takes place Sunday, Oct. 1, at Roseland Village Neighborhood Center, 555 Sebastopol Road, Santa Rosa. Noon to 6pm. Free. roselandcommunityfestival.com. Read a Spanish version of this article at Bohemian.com. PARTNERS IN COMMUNITY Jake Ward, left, and Neil Pacheco team up to put on the Roseland Community Festival. Roseland is a neighborhood in transition. Located west of Highway 101 and south of Highway 12, the area is an unincorporated island under the governance of Sonoma County, though Santa Rosa is moving to annex the burg and incorporate it into the city proper. Roseland is also a cultural bastion for local artists, musicians and working-class Latino families. Its mix of affordable properties and rich heritages make for unique culinary destinations and DIY artisan experiences, many of which will be on display at the inaugural Roseland Community Festival on Oct 1. The bilingual affair is the brainchild of event planner and promoter Jake Ward, who lives in Roseland and hosts the monthly North Bay Cabaret events at the Whiskey Tip. "The initial inspiration was wanting to do an event featuring Roseland-based artists," Ward says. "It's an underserved community in terms of the arts. There's no performing arts center and there's no conversation about Roseland being an arts hub, but a lot of local artists live there. And not just Latino artists—all sorts of artists." This summer, Ward received funds from Creative Sonoma, as part of the economic development program's Pop Up Creativity Grants, to get the ball rolling. "I knew I was going to need help," Ward says. "Particularly a strong partner within the Latino community who could help pull in artists and vendors." 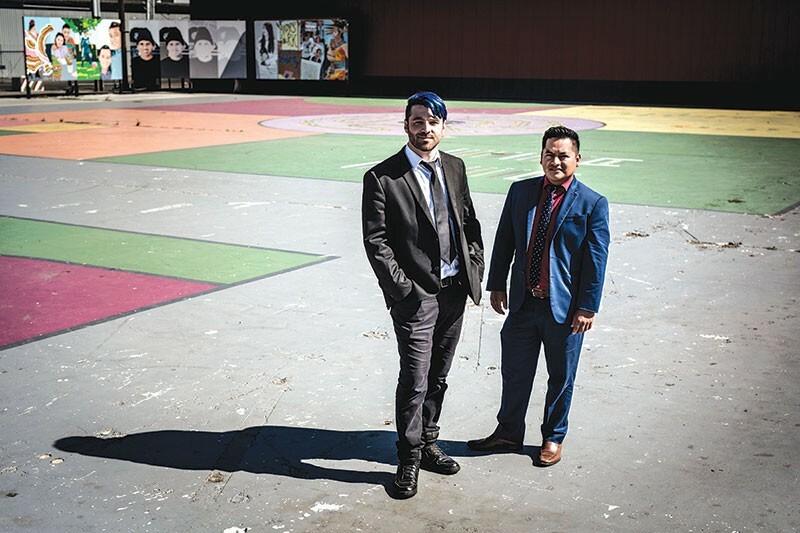 Through his connections, Ward met Neil Pacheco, who works as a Latino marketing and hospitality coordinator at Graton Resort & Casino. "One thing that really touched me" about the idea for the event, Pacheco says, "was the blending of two communities. That's very important to me." The festival is slated to offer two stages of entertainment, in English and Spanish, with music from Banda Pacifica, Black Sheep Brass Band, Nuevos Aventureros, Oddjob Ensemble, the Easy Leaves and others paired with Oaxacan cultural dancers, Miss Latina Wine Country, a low-rider car show and more. Roseland's culinary offerings will include food from El Paisa Taqueria, Sazón Peruvian Cuisine, Cancun Mexican Restaurant, Pacheco's Roasted Corn and others. Art from local talents like Martín Zúñiga, George Utrilla Angulo and others will be on display, and a kids' area will feature interactive sculptures, games and activities. "This is about supporting Roseland," Ward says. "Getting people from outside of Roseland to come in, see it and celebrate it." La communidad de Roseland is un vecendario este de highway 12 esta zona por mucho tempo nunca fue incorporada por la ciudad de Santa Rosa . La ciudad de Santa Rosa ahora esta por incorporar Roseland para que ahora sea parte de la Cuidad de Santa Rosa. La zona de Roseland es el centro cultural para artistas , musica y el hogar de la communidad mas trabajadora en nuestro condado. Igualmente demonstra ser zona donde vasa probar sabores authenticos. Este vencenedario offrece viviendas que la gente puede adqurie. Cantitad de estos negocios estaran presente el 01 de Octubre en el festival inaguaracion de Roseland. Este evento is bilingue por el promotor Jake Ward quien vive en Roseland "mi inspiracion fue crear una fuente donde artistas locals puedan lucir su talento "
Roseland es un zona que es hogar no solo para muchos Latinos sin no donde la gente comun, Los artistas la gente normal que le da sabores y color ha Santa Rosa. Es el sitio donde Los artistas viven. Este verano Ward recibio una suma de dinero de Creative Sonoma para crear fondos par que empiese a ver un pulso para mejoar la economia. Con sus conexciones Ward concio ha Niel Pacheco, Latino Marketing at Graton Resort ambos estan unidos para que este zona de conveirta una una communidad para todos. El festival habra dos sitios de entreteniemiento y incluyen baile tipico de Oaxaca , Miss Latina wine country y el show de autos low rider y mas.